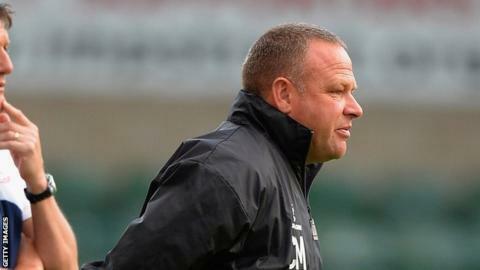 National League side Lincoln City are hoping to sign another striker, according to manager Chris Moyses. The Imps, who finished 15th in the Conference last season, beat a Norwich City XI in a friendly on Wednesday. "We're looking at other people and speaking to quite a few clubs actually - there's all sorts of offers on the table," Moyes told BBC Lincolnshire. "I'm not going to be bullied or rushed into taking on anything I don't want to." Under manager Moyses, who was appointed last December, Lincoln were beaten 3-1 by Premier League side Leicester City earlier in pre-season. "We knew they were similar to what Leicester were and would keep the ball better than most teams would and I'm really pleased with the defensive shape we had," said Moyses. "Tonight we scored one goal, which could have maybe been two or three more with a bit of luck, but the pleasing thing for me is the clean sheet. "I was really pleased with the fitness tonight and they played some nice football, they're a great bunch of lads and they're working hard." Lincoln begin their National League campaign at home against Cheltenham on Saturday, 8 August.